I’ve wanted to have a printable with this verse on it for a while. Of course we believe are children are a precious gift from God! I just love this verse. Every time I read it I am reminded of how blessed I am to be the mother of four beautiful people. There are definitely times I need to remember just how blessed I am. Especially when the days are long and exhausting! Yesterday in particular was a trying day. I had to take Isaac to the doctor for his four month check-up. Of course, I took all four of the kids with me. As we were leaving I had my arms full with Isaac’s car seat. I was trying to hold the door open and did not have my two year old’s hand. Instead of listening to me, he decided to bolt out into the parking lot. Thank God, there were no cars, but it was a terrifying experience for me. I was upset with him for not listening, upset with myself for not holding onto him before trying to open the door, and so thankful nothing horrible happened. Oh, these children! True blessings and givers of heart attacks! I made this printable to match one of my favorite pillows in my living room, but I think the colors are versatile. I really like the tree because it represents family, and building strong roots, which is perfect for this scripture. This printable was designed to be printed as an 8×10. It is available to those who subscribe to my weekly blog newsletter. Just sign up below to receive it! 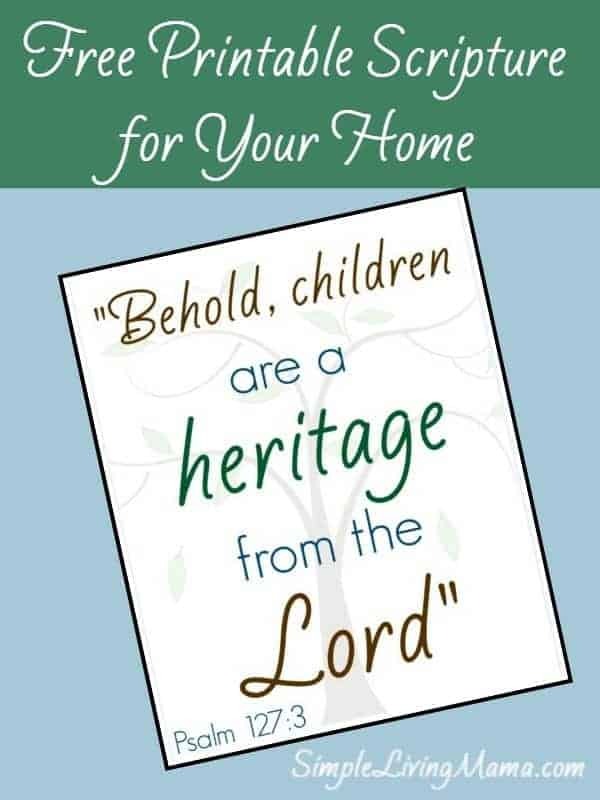 What are some of your favorite verses about children?